Operating System - Provides the machine level interface. Currently supported operating systems include Linux, Mac OS X, OpenBSD, FreeBSD, and Windows. Java JDK - Provides the Java runtime environment for executing the various required processes. MySQL Database - Provides the persistent storage for the Account, User, Device, EventData, and other database records. Tomcat Servlet Container - Runs the various GTS Servlets. Runtime Configuration - A set of ".conf" files providing global system-level settings and configuraton. GTS Libraries - The common set of utilities performing various basic functionality, such as String and Date manipulations, Socket-based connections, Database connections, etc. Device Communication Server (DCS) Modules - Provides the communication interface to remote tracking devices. GTS Track Servlet - The main web-based user interface servlet. This component is further broken down into is constituent components below. Other GTS Web-based Servlets - Other available GTS servlets including the "Events Servlet" (events.war) which provides a web-based method for extracting Device events, and http-based DCS modules (such as gprmc.war and gc101.war). The following sections will describe each of these in more detail. The Operating System provides the machine level interface on which the Java and MySQL environments can run. Currently the GTS has been successfully run on many different distributions of Linux (Fedora or CentOS preferred), Mac OS X (Leopard, Snow Leopard, and Lion), OpenBSD, FreeBSD, and Windows platforms (WinServer, XP, Vista, Win7, etc). 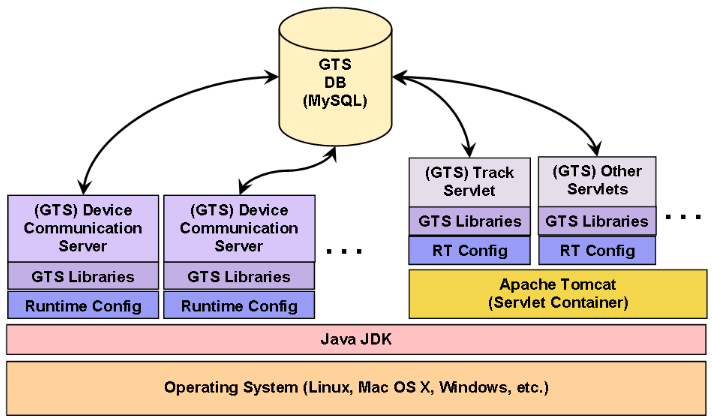 The Java JDK provides the compiler and runtime environment for running the GTS. It is important to note that the Java "JDK" (Java Developer Kit) installation is required, rather than the "JRE" (Java Runtime Environment). The "JDK" includes the runtime environment, as well as the compiler, which is needed both to compile the GTS code, and by Tomcat to create te dynamic web interface pages (ie. "JSP" Java Server Pages). The "JRE" contains only the runtime environment and is unable to compile any Java code. Access to the MySQL database is abstracted through the classes provided in the "org.opengts.dbtools" package. The main class in this package is the "DBProvider" class. This allows unplugging one database provider and plugging in another, such as Microsoft SQL Server or PostgreSQL (partial support is available for both of these alternate DB providers). When we initially started development of the GTS system (back in 2006), we had started working on using Hibernate as our database access layer. At the time it did not provide the features that we required in the GTS (the GTS relies a lot on metadata provided by the database provider). However, revisiting the integration of Hibernate into the GTS is something that would be very welcome should someone wish to volunteer their expertise in this area. The Tomcat Servlet container is used to run web-based modules, such as the "track.war", or "Track Servlet" user interface login module. It can also be used to run the M2M "events.war" event retrieval module, as well as various HTTP-based DCS modules, such as "gprmc.war" and "gc101.war" (more information on these modules can be found in the OpenGTS_Config.pdf document). Global system-level settings are configured in one of the ".conf" files available in the GTS installation directory. There are several ".conf" files available which are arranged in a hierarchy to allow for having configuration files that seldom change, or other configuration files which may change more often. A property setting may be specified in more than one file, however it will always be the last property setting that "wins". That is, the value assigned to a property will always be the last value assigned in the hierarchy. This is the preferred configuration file where all customer specific configuration changes should be placed. By default, all property settings in this file are commented with a prefixing "#" character. When setting a property in this file, the line must first be uncommented (ie. remove the prefixing "#"), then its value should be set according to the custom requirements of the installation. This can be a copy of the "config.conf" file from the previous installation of the GTS. This allows more easily porting customer specific changes from a previous version to the current version. Customer specific changes to the configuration as shipped by GeoTelematic Solutions, Inc.
General custom configurable items. (for most installations, this file should never change). The general company name/id configuration. The main loaded config file entry point for servlet-based processes. Most property changes defined in the "private.xml" and/or "private/private_common.xml" file can be overridden with a property configuration setting in the "config.conf" file. When attempting to make a configuration change to the system, first check the "config.conf" file to see if a property override setting is available. If not, then go ahead and modify the "private.xml" and/or "private/private_common.xml" file if necessary. The "config.conf" should be examined to see all of the available property settings that can be configured within this file. A Device Communication Server (DCS) is the module that listens for incoming connections from a specific type of remote tracking device and understands how to communication with the device to parse incoming data, and insert the received events into the EventData table. In some cases the DCS will also generate additional events based on changes in the Geozone arrival/departure state, or detected changes in the digital inputs. Those that receive data over a general TCP or UDP connection. Run as a separate process. Configured within the XML files in the "dcservers/" directory. Examples include the "sanav" and "tk10x" DCS modules. Those that receive data over a HTTP connection. Run within the Tomcat servlet container. Configured using the property settings in the "webapps.conf" file. Examples include the "gc101" and "gmprc" DCS modules. In addition to the above configuration settings specific to the DCS, the various ".conf" files in the GTS installation directory are also used to provide runtime configuration to the DCS process. Defines one or more "Domains" to which the specified settings will apply. This feature is used to allow specifying a different set of attributes to different login domain names (such as "taxi.example.com" and "plumbing.example.com"). When used in this manner, the "private.xml" file can include multiple instances of the "private/private_common.xml" and provide overriding property settings for specifying different MapProviders, ReverseGeocodeProviders, login banners, etc. Sets the primary language/localization for the displayed text. Assembles the various pages which will be available for user selection on the main menu, such as which map pages, reports, and administrative pages will be available for user selection. Sets the JSP (Java Server Pages) template which will be used for the display of the various assembled pages. Sets the MapProvider that will be used to display maps, and what features will be available on the map. Sets the GeocodeProvider (turning an address into a latitude/longitude), ReverseGeocodeProvider (turning a latitude/longitude into an address), and MobileLocationProvider (obtaining a latitude/longitude from the serving cell-tower information) that will be used for the Domain. Sets the reports which will be available for user selection on the Report Menus. The reports themselves are defined in the XML file "reports.xml". loginSession_sbanner.jsp - A general template which will display a header banner at the top of the page and the page title text centered on top of the banner. loginSession_cbanner.jsp - Similar to "loginSession_sbanner.jsp" above, except that the page title text is not displayed within the banner. This is used when the displayed banner image already contains the company name information. loginSession_wbanner.jsp - Displays a wide header the full width of the browser page frame, with the banner image placed to the left of the header area. emailReport.jsp - This JSP template is used exclusive for the creation of the html when emailing a selected report (via the "EMail" selection from the pull-down option on the various report menus). The various JSP templates utilize Java "Tag Libraries" for indicating where the various web pages should display their content. You can see the tag-library usage by searching for the tags "gts:var" and "gts:track in the above JSP files. The web-pages which will be available to the user are defined in the "WebPages" tag section of the "private.xml" and/or "private/private_common.xml" files. Within this tag section, there will be a "Page" tag definition for each web page that will be made available to the user for selection. The "Page" definition specifies the Java 'class' that is to be used to create the content of the page, and whether the class definition is optional (an optional "Page" definition will not generate an error if the class is missing or not found). events.war "Events Servlet" - This servlet provides the ability to extract a set of specific Device events in CSV, JSON, or XML format, through a web-based interface. gprmc.war "GPRMC Device Communication Server" - This servlet provides a generic interface for phones or other devices that can send location information to the server. The phone, or other device, typically encodes the location data in a URL which is then sent to the server. This "GPRMC" DCS then receives the data, parses the location information from the URL, and inserts the corresponding events into the EventData table. 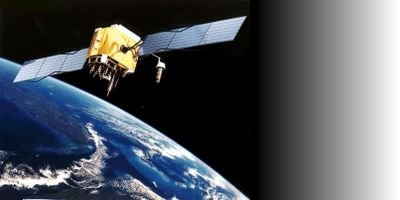 gc101.war "Sanav GC101 Device Communication Server" - This servlet provides the specific interface for most Sanav devices to receive data from the remote tracking devices in the Sanav event data packet format. Like the gprmc.war DCS, this DCS received location information encoded in the URL, then parses and inserts the events into the EventData table. In some cases, there may be other servlets as well with may perform a function similar to one of the above. These various servlets obtain their runtime configuration from a combination of the "private.xml" (or "private/private_common.xml") files, or the various ".conf" files available in the GTS installation directory.